Truffles so rich, smooth, and beautifully decorated—you’ll think you’ve gone to chocolate lover’s heaven! These melt-in-your-mouth treats come in a variety of flavors, like milk chocolate and dark chocolate cherry. You’ll soon see why there’s nothing like biting into the creamy center of a gourmet chocolate truffle. Total Net Weight: 1 lb. 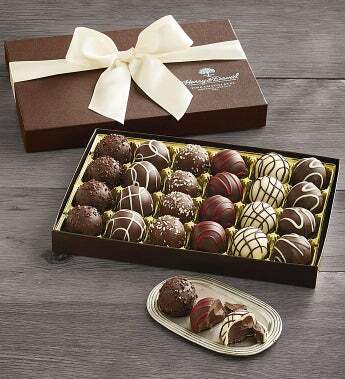 Truffles so rich, smooth, and beautifully decorated -- you'll think you've gone to chocolate lover's heaven! These melt-in-your-mouth treats come in a variety of flavors, like milk chocolate and dark chocolate cherry. You'll soon see why there's nothing like biting into the creamy center of a gourmet chocolate truffle.